Odyssey 20/20 Eyeware launched a Jimi Hendrix signature eyeware line, featuring 4 new and exclusive models. Spark Marketing Entertainment brought the two partners together and oversaw the day-to-day project management. 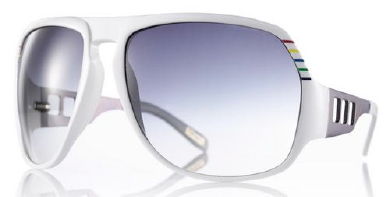 Odyssey 20/20 launched a luxury priced limited edition pair of sunglasses, as well as a mass market version featuring Jimi Hendrix’ signature. 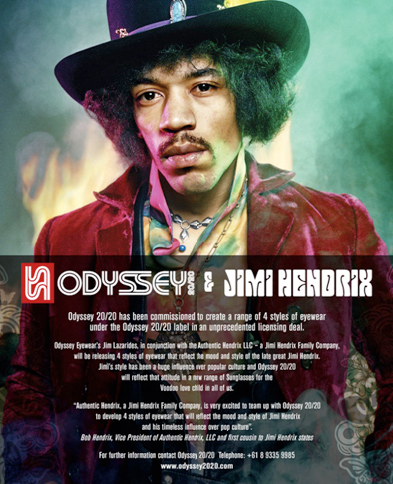 Bob Hendrix, VP of Authentic Hendrix LLC, and first cousin to Jimi Hendrix said: “Authentic Hendrix, a Jimi Hendrix Family Company, is very excited to team up with Odyssey 20/20 to develop 4 styles of eyeware that will reflect the mood and style of Jimi Hendrix and his timeless influence on pop culture”. Odyssey 20/20 was the brain child of Australian optical designer Jim Lazarides, taking contemporary surf and street styling into the future. Jim previously joined creative forces with Greg Arnette to establish Arnette, one of the world’s leading eyewear brands throughout the nineties. Odyssey 20/20 is Jim’s latest assault on the international market since selling Arnette in 1997. The Jimi Hendrix eyewear was designed by Jim Lazarides personally.